Maize is one of the main cereal crops grown all over the world. The presence of microbial endophytes which reside asymptomatically inside maize seeds may influence the yield and quality of crop. The present review concentrates on underexplored endophytes, such as seed-borne bacterial and fungal endophytes. The review encompasses the role of maize seed’s endophytes in enhancing crop efficiency, the nature of vertical transmission and secondary metabolites production, their belowground function, and the aboveground response. The diversity of endophytes in maize seed is discussed in detail focusing also on methodology applied for their isolation. 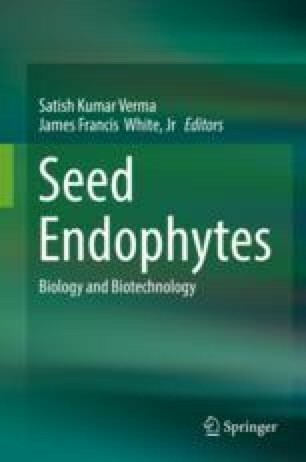 This review may render help for the researchers working on the improvement of crops modulated through seed endophytes. Authors are thankful to the Department of Botany, MMV, Banaras Hindu University for providing necessary facility. RL acknowledges UGC New Delhi, for Junior Research Fellowship. Financial support from SERB, New Delhi (EEQ/2016/000555), is greatly acknowledged. RNK expresses his thanks to SERB (DST), New Delhi, for project (SB/EMEQ-121/2014) and to Head & Coordinator, CAS and DST-FIST in Botany, Institute of Science, BHU, Varanasi, for facilities.